FIIs were net sellers of equity on all 5 trading days during the week. Their total net selling was worth Rs 21.3 Billion. DIIs were net sellers of equity on Wed. (Jan 2), but net buyers on the other four days. Their total net buying was worth Rs 5.1 Billion, as per provisional figures. The Nikkei India Services PMI slipped to 53.2 in Dec ’18 from 53.7 in Nov ’18 due to slower rise in new orders. (A number more than 50 indicates expansion.) The Composite PMI (Manufacturing + Services) moved down to 53.6 in Dec ’18 from 54.5 in Nov ’18. During Apr-Nov ’18, the government’s total net indirect tax collection (inclusive of CGST, IGST, and GST-Compensation Cess) has been Rs 6.13 Trillion, which is about 55% of the budget estimate for FY 2018-19 of Rs 11.16 Trillion. The index touched a lower top of 36285 on Mon. Dec 31, and closed at a weeks high of 36255 on Tue. Jan 1 – but succumbed to bear selling during the next two days. On Fri. Jan 4, the index bounced up after receiving support from its 200 day EMA but faced resistance from its 50 day EMA. It formed a ‘reversal day’ bar (lower low, higher close) which can provide temporary respite to bulls. Sensex closed just below 35700 for the week – losing about 1% on a weekly basis – but managed to close above its 200 day EMA in bull territory. Daily technical indicators are looking bearish. MACD is falling below its sliding signal line in bullish zone. ROC is below its 10 day MA in bearish zone. RSI and Slow stochastic have slipped below their respective 50% levels. Note that MACD, ROC and Slow stochastic are showing negative divergences by touching lower bottoms while Sensex touched a higher bottom. Bears may use the fact to their advantage next week. Global growth and trade uncertainties, plus an upcoming general election whose outcome is in some doubt, means the stock market will remain volatile till those uncertainties get removed. Small investors should position themselves accordingly. Money-making during the first half of 2019 won’t be easy. 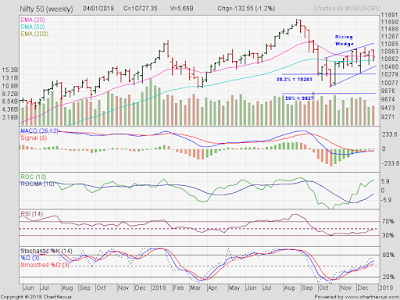 The weekly bar chart pattern of Nifty has been trading within a bearish ‘rising wedge’ pattern for the past 12 weeks. The likely breakout from the ‘wedge’ is downwards. For the past 6 weeks, the index has been alternately closing above and below its 20 week EMA. Both the 20 week and 50 week EMAs are moving sideways – giving no clear trend indications. With FIIs pressing the ‘sell’ button during the first trading week of the year, the balance may be shifting towards bears – though it may not be obvious from the chart. Weekly technical indicators are looking neutral to bullish. MACD has merged with its signal line and moving sideways just below its ‘0’ line. ROC has entered its overbought zone. RSI has moved up to its 50% level. 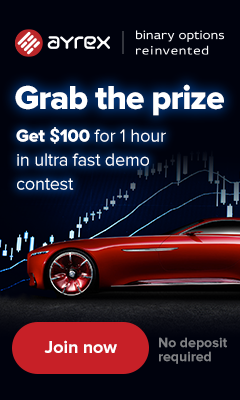 Slow stochastic is rising above its 50% level. Nifty’s TTM P/E has moved down to 25.84, but remains well above its long-term average in overbought zone. The breadth indicator NSE TRIN (not shown) has recovered from overbought zone to neutral zone, hinting at some more near-term index consolidation. Bottomline? 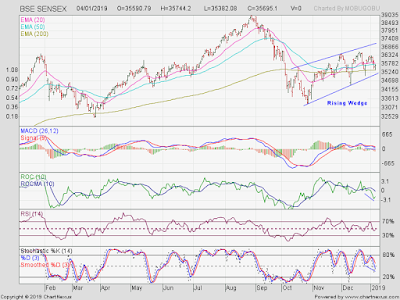 Sensex and Nifty charts have been consolidating within bearish ‘rising wedge’ patterns for the past 12 weeks. Likely breakout from such patterns is downwards. Both indices can touch lower levels before they rise to touch new highs in 2019.